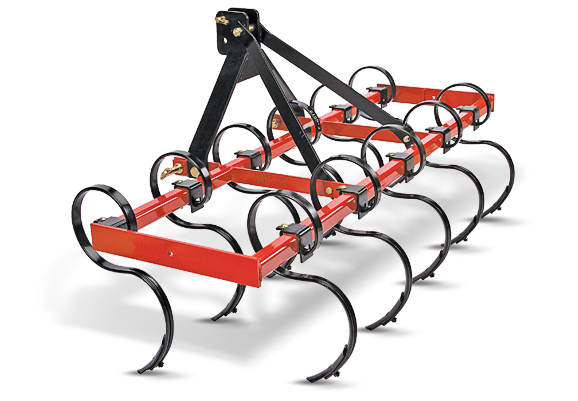 THE FARM KING CULTIVATOR OFFERS SUPERIOR SOIL PENETRATION WITH EVERY PASS. This cultivator is designed to give the operator optimal depth control and even soil distribution. Heavy-duty gauge wheels and a rigid design allow the cultivator to remain stable when digging deep into the soil. The shanks are easily adjustable with the help of a single bolt space adjustment clamp. Proper shank spacing allows for uniform soil distribution and minimal nutrient loss. Category I 3-point hitch; all models are Quick Hitch compatible and feature a single bolt spacing adjustment.